Reduce your labelling costs with on-demand colour printers! 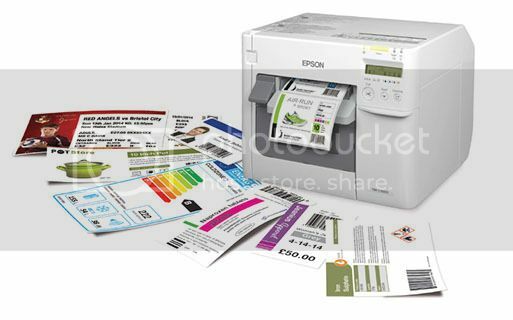 No longer will you be wasting printed labels, as AM Labels range of colour label printers are designed for both short and long on-demand print runs, allowing you to print the exact quantities of labels required. There are two different types of inks that colour printers utilise; dye and pigment based. Each has their advantages, dependant on different environments and applications. 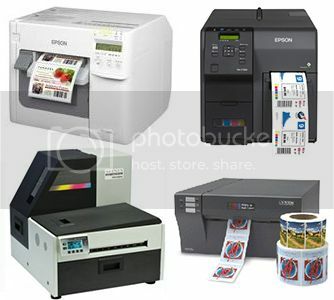 Check out a selection of our most popular colour label printers below - no matter what your needs, we are sure to have the right printer for you. Print high-quality labels in-house and on demand. Ensuring consistent results every time, the ColorWorks C7500 features Epson's new PrecisionCore MicroTFP printhead with unique Nozzle Verification Technology (NVT) and dot substitution to ensure consistent prints and prevent dead pixels. Quickly and easily produce a range of high-quality labels for food and beverage products, packaging and boxes, EU energy labels, GHS labels and more. 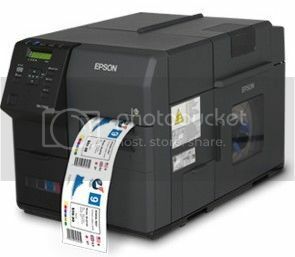 With print speeds of up to 300mm/sec, you can now print labels in full colour at the same speed as some thermal monochrome printers, with no compromise on print quality. 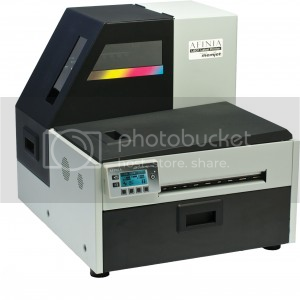 Packed with performance, the Afinia L-801 is a high speed, high resolution colour inkjet powered by Memjet thermal technology, which boasts printing speeds of 12 inches per second. Ideal just-in-time on-demand labelling requirements, the L-801 is perfect for short and long, high definition printing runs at 1600 x 1600 dots per inch print resolution. Built with an all metal construction, the printer is robust and features an interal label roll holder, which helps prevent dust entering the system and maintains a high print quality. Although the buy price is higher than its competitors, a return on investment is guaranteed as the L-801 has the lowest cost-per-label on the marketplace, proving that printing in-house can be substantially cheaper than outsourcing printed label production. 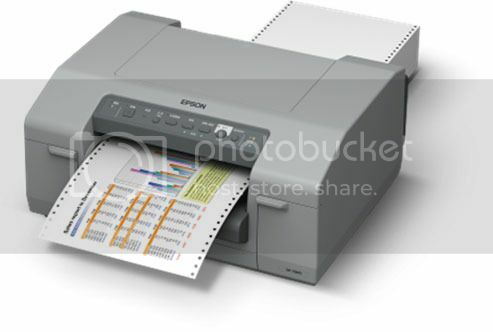 Designed for precision and large-volume label printing, the Epson C831 is an 8 inch wide format inkjet printer designed to handle the rigors of industrial printing. Equipped with a tractor-feeding system, the GP-C831 has significantly less paper jams and also shows increased printing accuracy amongst its competitors. Simply produce accurate labels with a sharp print resolution of 720 x 720 dots per inch. With Epson's world renowned durable inks, the printouts maintain excellent resistance to substances such as water, chemicals, oil and sunlight, providing fantastic longevity and ensuring they are suitable for products with a long shelf life. The VP495 was based on the success of the VP485 and maintains all of the same advantages - including large capacity ink cartridges and an external unwinder, but with added label durability due to the pigment ink cartridges. With plug and play as standard, the VP495 can be up and running within minutes of unboxing the printer and includes an intuitive LCD display and label design software to help you get started. 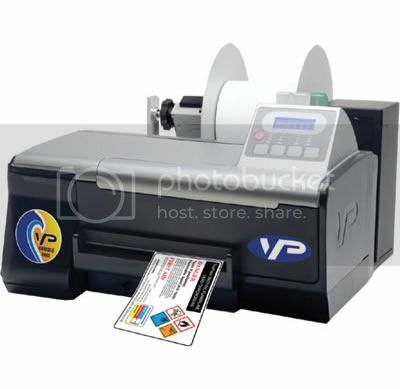 Designed for short medium print runs, the VP495 is capable of printing up to 1,000 labels per day with printing speeds of up to 4 inches per second. 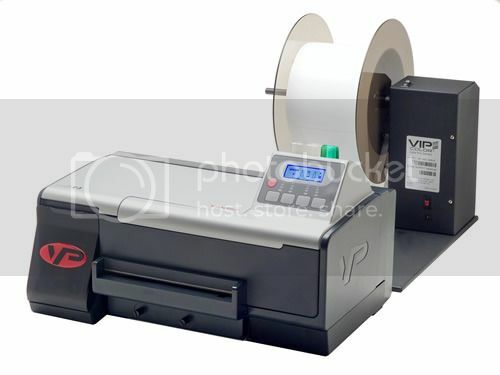 The VIPColor VP485 is a dye-based, 8 inch colour label printer, which utilises advanced inkjet technology to produce high impact labels with deep rich colours. With large ink cartridge capacity, the VP485 is ideal for medium printing runs at 5 inches per second print speed. The print resolution is still consistently high, with a 1200 x 1200dpi resolution, which ensures printouts are high quality and affordable. Boasting a low total ownership costs, the VP485 comes with an external label unwinder for fewer ink and label changeovers. Affordable and compact, the Epson TM-C3500 is 4" entry-level pigment based inket printer designed with the user in mind. Easy to use and perfect for first time labelling users; the media is simple to load, with a clear LCD display, that clearly indicates ink levels and the printer status. With printing speeds of up to 4 inches per second, the TM-C3500 is ideal for short bespoke labelling runs. Whether it's printing packaging labels with colourful logos and picture, or tickets and ID cards with crisp barcodes and product information, the 720 x 360 DPI print resolution of the TM-C3500 ensures you can print it all from one machine. Dye based or Pigment based ink? Vibrant colours and exceptional photo quality labels are the key benefits of dye based inks, making them ideal for a range of applications where brand and product appearance is vital, including food products and bottle labelling. With good water and smudge resistance, these labels can be used inside humid food manufacturing plants. Pigment based inks provide less vibrant colours than dye inks, but provide significantly superior resistance to a range of substances including water, oils, chemicals and sunlight. What product is suitable for your application? Finding the right materials is difficult; whether they need to be aesthetically pleasing or have supreme longevity and durability. The table below shows the compatible inkjet materials we can offer. * State the material is applicable when the printer is set in composite mode, which is the creation of the black ink via Cyan, Magenta and Yellow inks. Call us now on 01536 414 222 or email sales@amlabels.co.uk to discuss the perfect solution for your business.